I’ve tried several different trolling patterns and believe that you should only troll as many lines as you have fishermen in the boat. Trolling more lines introduces more opportunities for tangles should you troll into a school of GTs for example. 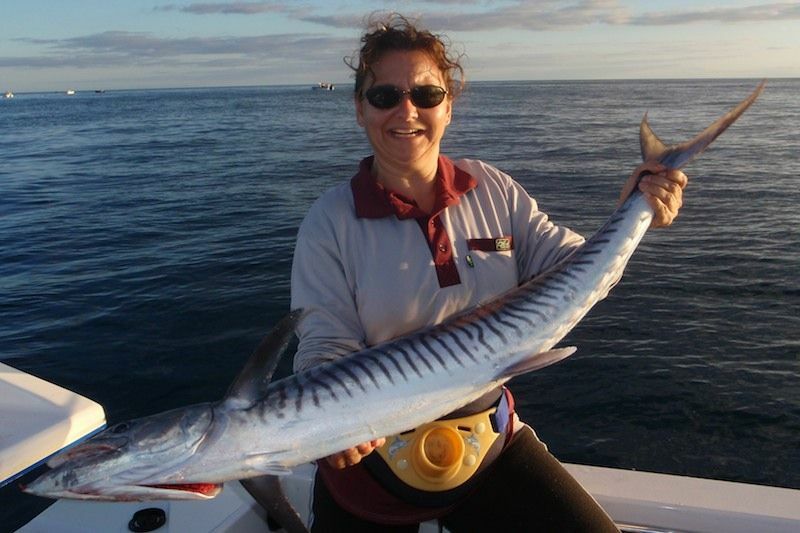 I swim one lure/dead bait only about 10 metres behind the boat, just under the prop wash. I think this lure/bait gets plenty of contrast from the prop wash and often this is the first lure/bait hit. The second lure/bait I swim around 25-30 metres from the boat, only increasing this distance when depth is required, e.g. 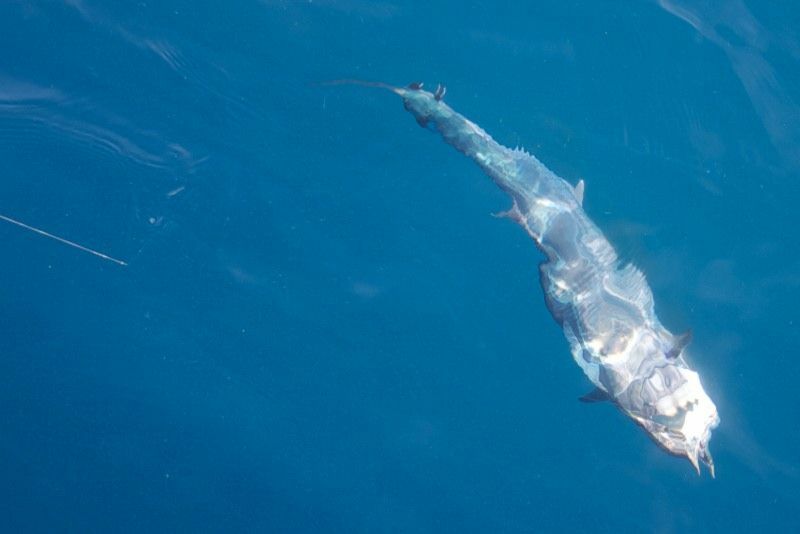 for a large bibless lures in deep water, or lighter bibless that I’m trying to swim deeper. It might be easier though to swap to a heavier bibless and have 25-30 metres of line out. For my heaviest bibless lures I only run 15-20m of line as that’s plenty (watch the angle of line into the water). For pusher style lures or poppers (yes poppers work very well on Macks), let out line until the lure consistently breaks the water surface, which will provide plenty of contrast and vibrations through the water. A popper is a good option when you are also swimming a weighted bait deep, that way you’re covering two parts of the water column, not just the surface. Personally I try not to troll with the current as the lure/bait will be trolled quicker to achieve the same action. I usually troll against or across the current. If possible I try not to troll directly into the sun, I’m unsure if the sunlight makes Macks gun-shy, however the glare on the water makes spotting bommies/pinnacles more difficult so I try to avoid it, especially on new ground. The only time I troll with the current and into the sun is when circumnavigating a small reef, an isolated bommie, pinnacle or rock. Remember that bait congregate on the pressure points of the reef so that’s a prime trolling location. 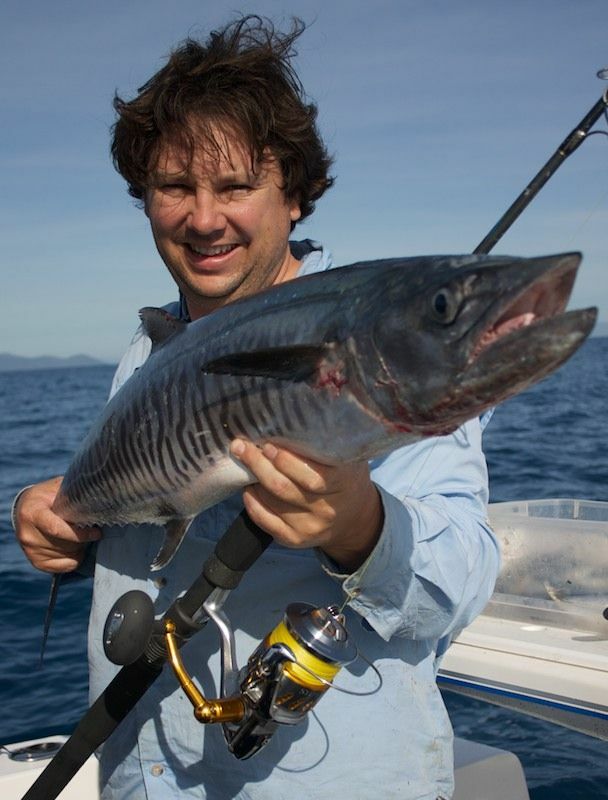 When trolling shallow reef edges in particular, I often change the lure/bait closest to the reef to a popper or small bibbed minnow lure of around 15cm in length. 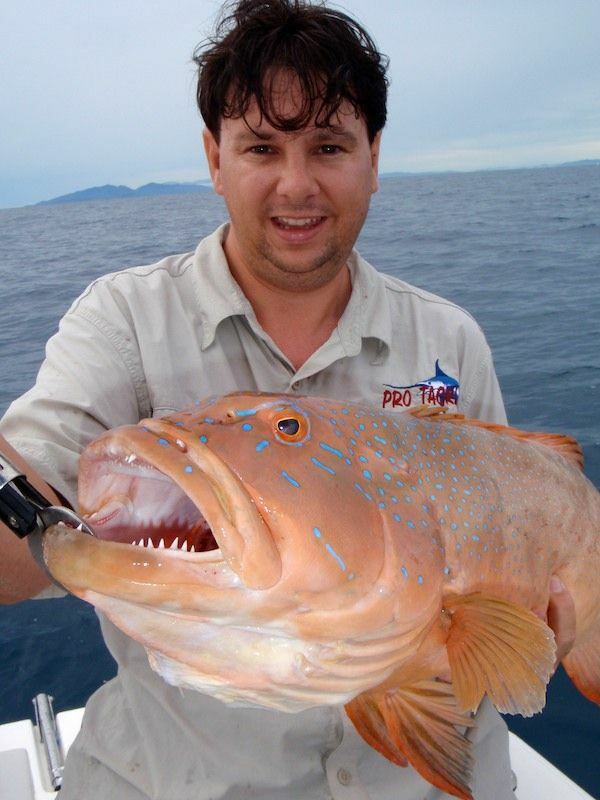 The bonus in this technique is that although Macks will also hit poppers and small minnows, so will Coral Trout (for us Northerners). Generally I try to stay 2-4 meters from the reef edge and get ready for a rampaging trout to hit the lure, you need to attend to the rod quickly in this situation as Trout will dive for the nearest ledge/hiding hole. 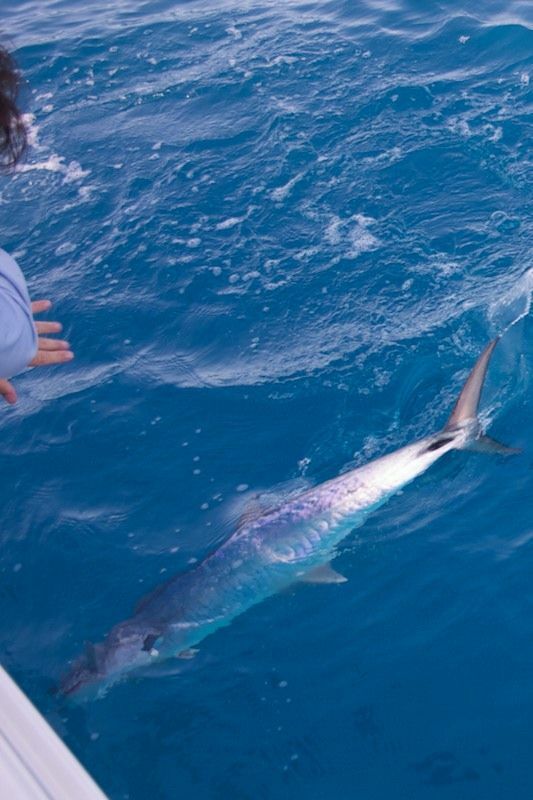 Ideally this inside lure should be run fairly short at around 10 metres with its counterpart lure/bait run back at least 30 meters behind the boat, this affords and opportunity for the boat driver to pull away from the reef quickly without tangling the lures, increasing your chances of landing the Trout. When trolling for Trout I up the drag so that it is around 1/3 of the breaking strain, being that close to structure anything less and you’re going to lose a lot of lures. Depth (same as the fish/bait). I advocate trolling in two parts of the water column, i.e. 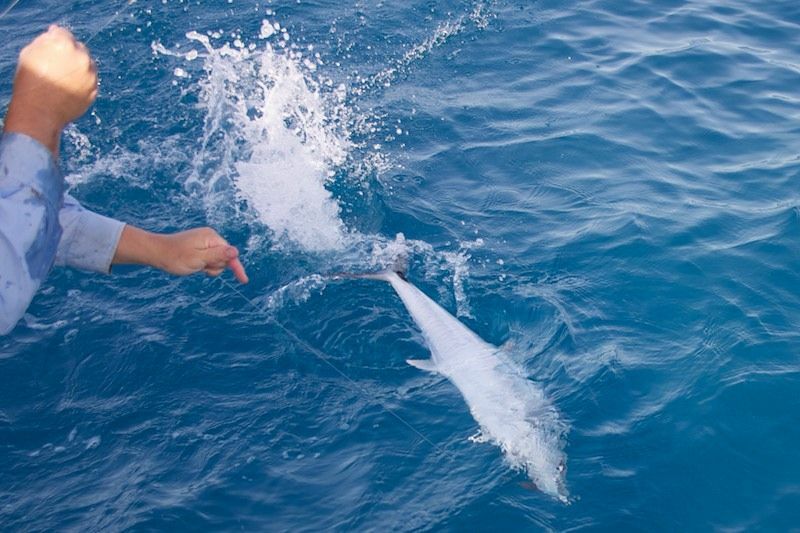 if you have a unweighted or lightly weighted gar just under the surface to about 2m of depth, then run a large bibbed lure, or a heavy bibless at the same time, large bibbed lures that work well at low speeds are probably the best in this instance. If you see arches on the sounder find a lure/bait that you know will swim at that depth, or even better about 2m above that depth. This can be a bit of a guess judging by the amount of line you have out, and the angle of the line to the water. During the early mornings or later afternoon Macks will swim higher in the water column, particularly if feeding; however, I’ve seen plenty of Macks around 1.5-2m in depth in the middle of the day when it’s particularly cloudy. 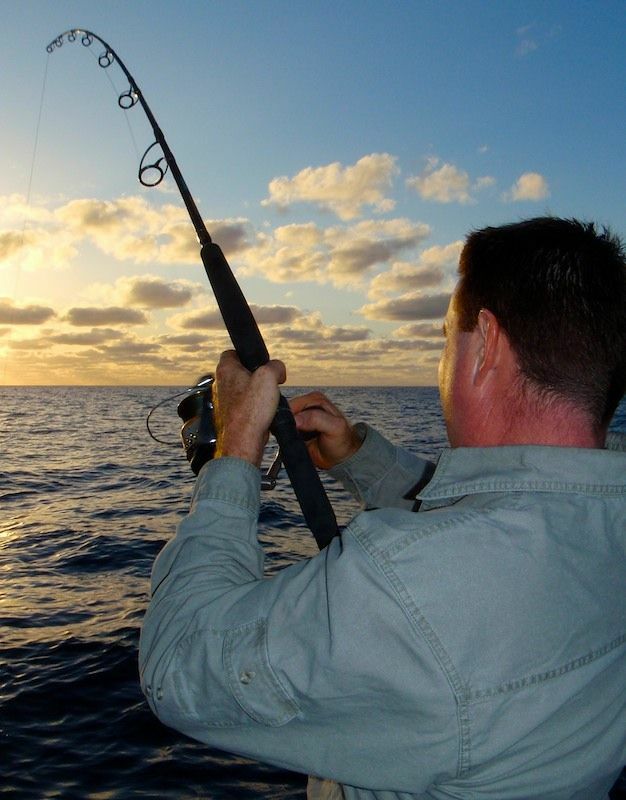 During the brighter parts of the day you need to fish deep, this is not a time for surface baits as the fish aren’t near the surface and are unlikely to charge into the sunlight, you may get the occasional fish at the surface but you’re not fishing with percentages (putting the lure/bait where the fish are). Seems pretty straight forward, and it is but there’s a couple of tips I’ve found have helped me. The first is to beat the head of the fish (on top between the eyes) with a donger (wooden rod or similar) while the fish is still secured by the gaff (when possible), and the fish is in the boat so in the unlikely event that the fish gets off the gaff, you still have it. Everyone else should give the guy with the gaff and donger a fair bit of room. Secondly after giving its melon a flogging I like to grab into the gills with a gloved hand, then remove the gaff with the other hand and hand it to a deckie so it’s out of the way. I then cut the gills while controlling the fish. You have to pay attention but this is easier and safer in my opinion that cutting a fish that isn’t secured. Then throw the fish into a kill tank or similar. Under no circumstances bring Macks into the boat without a gaff, or hand in the gills securing them, those razor sharp teeth can rip flesh to the bone, even a glancing blow could ruin your day… and if that glancing blow is groin height! Ouch!! I’ve seen quite a few people tail grab macks and bring them into the boat; well whatever you think is best but remember that generally your legs and feet are exposed when fishing so a dropped mack will definitely leave a mark. Well that’s it, some things that I’ve found help me and I hope that they help you in some small way. Remember too that before you bag one technique saying that it doesn’t work, try it for a while (several trips) first and try it alongside your existing technique, it may change your opinion. Lastly find the fish and fish the depth. If the fish are staying low in the water column then run both baits/lures low, if the fish are near the surface run both baits/lures high in the water column. If you aren’t sure where the Macks are then troll where the bait is. If there’s no bait and no arches on the sounder then consider trolling two bibless lures so you can increase your speed and try to find some bait/arches to target. If you troll a small reef system and don’t see a decent amount of bait/arches then head off to the next bit of structure.